Pupils from Abbeyhill, Leith and Hermitage Park Primary School’s attended Hibernian FC on Monday 27 February for a Show Racism the Red Card Event organised in partnership with City of Edinburgh Council and Hibernian FC. Guests on the day included first team Hibernian FC Isaiah Osbourne and Roy O’Donovan, ex-professionals and Show Racism the Red Card coaches Gary MacKay, Derek Ferguson and Michael Weir, along with representatives from City of Edinburgh Council and Councillors Gordon Munro and Lesley Hinds. The guests spoke about their experiences of racism and sectarianism and offered advice on how to deal with, and combat, racism and sectarianism whenever it occurs. 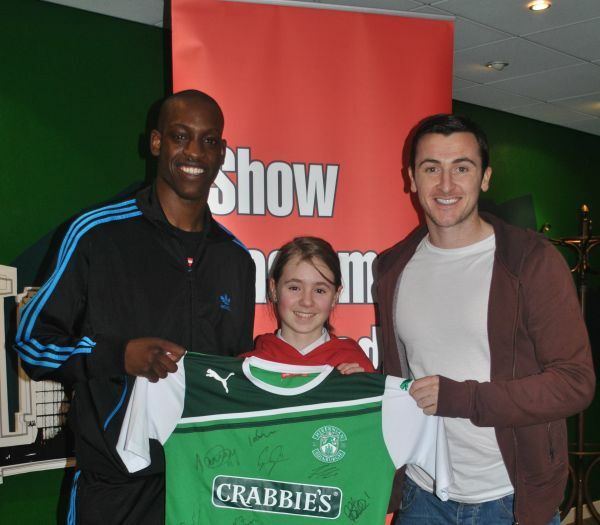 Pictured above first team Hibernian FC players Isaiah Osbourne and Roy O’Donovan with Abbeyhill Primary School pupil.